It’s no secret that I’m not the best at baking. 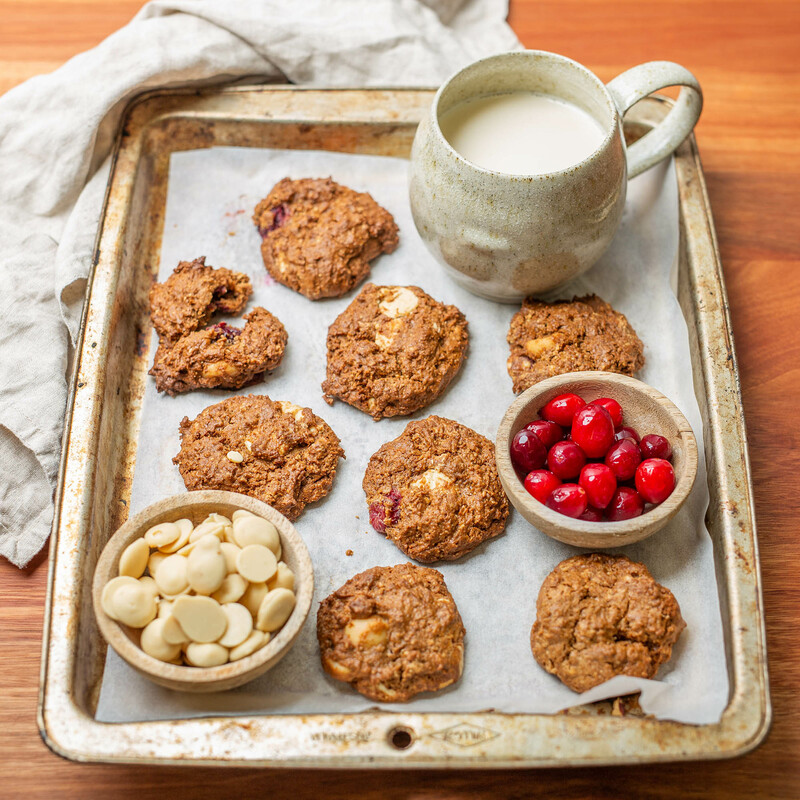 Until recently I’ve been relying heavily on my foolproof almond meal cookie recipe for pretty much all my cookie creations but even though I love that cookie recipe, it’s kind of crumbly, hard and biscuit like and I really wanted to try a cookie with a different type of texture. My favourite type of cookies have always been the really soft fudge cookies like a Mrs Fields cookie (obsessed) but I genuinely didn’t think it was possible to get that same texture from a healthy vegan cookie so I never tried! Until now! I am so excited about this recipe because not only does it nail the fudge texture it’s also very easy to make. 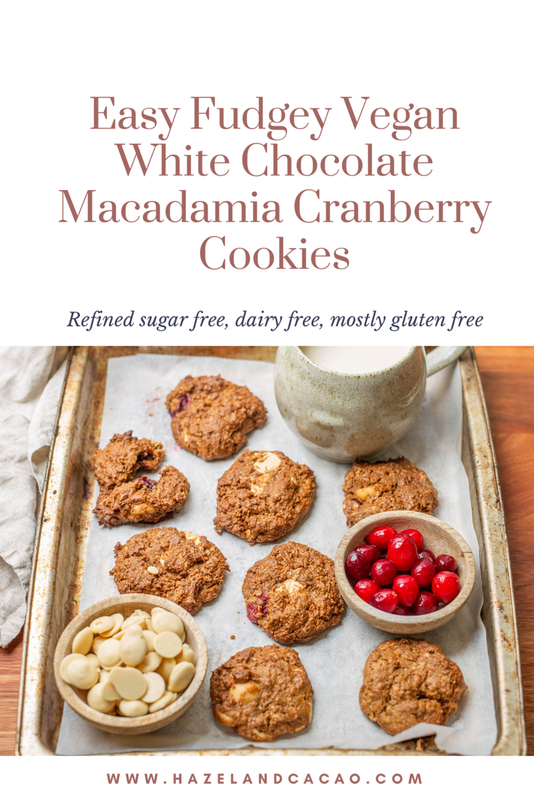 The recipe is very adaptable, I made it around Christmas time so I was using more Christmassy flavours like macadamia and cranberry but you can add any add-ins you want (I can’t wait to try a straight chocolate chip variation). It also works with most flours including gluten-free flour blends but I like to use wholemeal spelt because for me it is the most nutritious option. Unfortunately for these photos, my whole meal spelt flour was quite a course and I feel like it hides the true fudgy look of these cookies. The first time I made them the flour was much finer and they turned out absolutely professional (except for the fact that I didn’t allow enough room for them and they spread into each other). 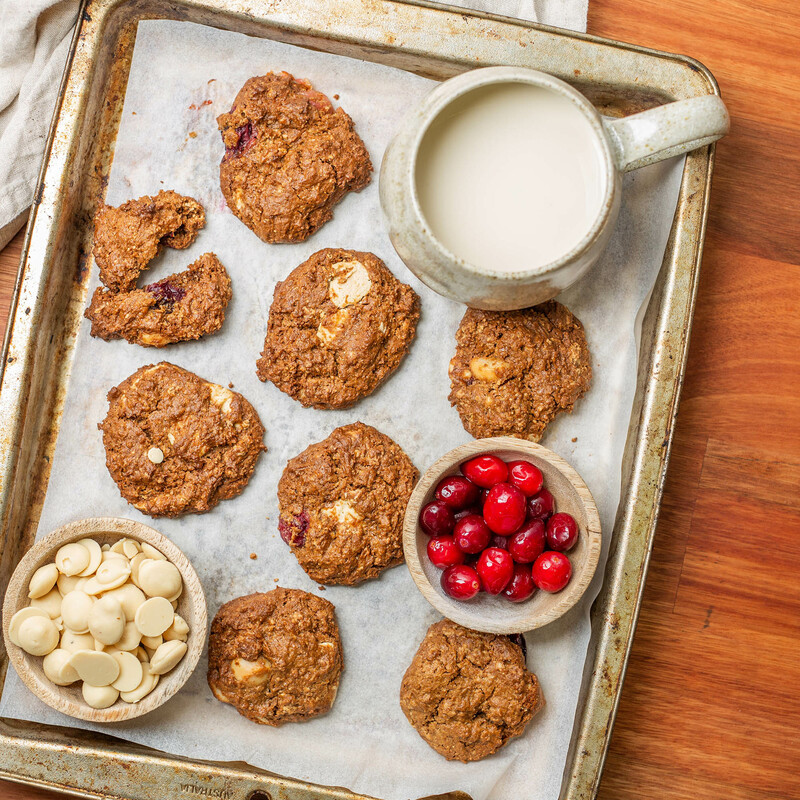 You can also use any nut butter you like however the trick to making these cookies taste authentic is to use the cashew butter. Cashew butter is a lot milder than most other nut butters so doesn’t impart a strong flavour. It’s a really good alternative for normal dairy butter. I used vegan white chocolate chips because I miss white chocolate and it’s very difficult for me to find vegan white chocolate. I was very excited about them when I found them however just because they are vegan doesn’t mean they are healthy. Even though the cookies themselves are technically refined sugar-free The white chocolate chips still have a ton of sugar in them as well as some slightly questionable soy-based additives and unfortunately I could feel it straight away. My body isn’t accustomed to eating refined sugar anymore and I get an almost instant headache when I have it. 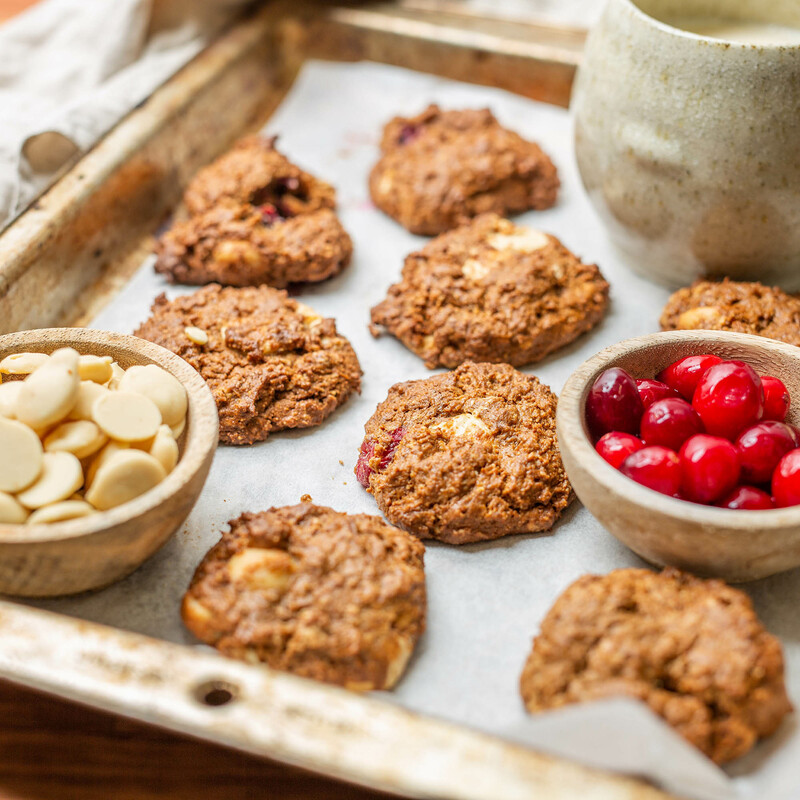 I allowed myself the white chocolate because it was Christmas time but honestly next time I’ll be using my low sugar dark chocolate chips with health-friendly ingredients. 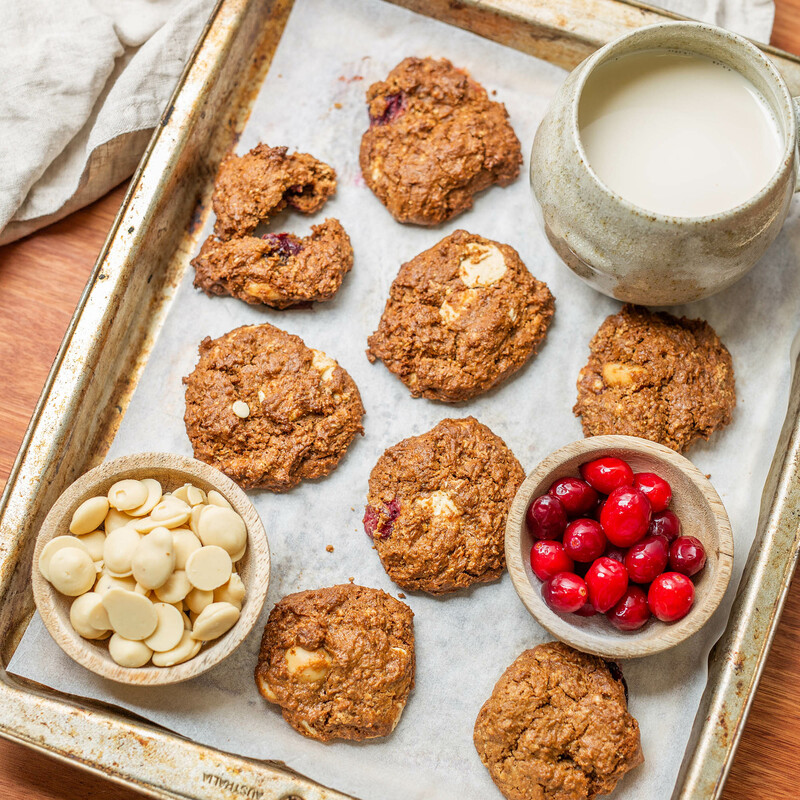 If it weren’t for the white chocolate, these cookies would be quite healthy and full of healthy plant-based fats and a little protein to support hormone health. I love using cashews in desserts (as you can tell from my raw vegan desserts) because not only are cashews high in healthy plant-based fat and protein but they are also very good at lifting the mood. Most people are unaware that eating a handful of cashews a day have the same effect as an antidepressant tablet. I’ll just end it here by saying I’m so happy to have found an easy healthy soft and fudgy cookie recipe that’s vegan! This will become my base fudgy cookie recipe and I can’t wait to try different alternatives for it! I hope you enjoy the recipe as much as I do!